Fredrik is a Principal and Head of the Nordic Technology & Innovation Management practice. 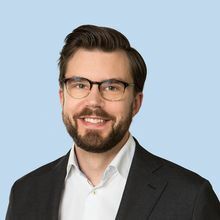 Based in Stockholm, Fredrik advises clients on innovation management and digitalization issues, primarily in the healthcare and manufacturing sectors. Since joining Arthur D. Little in 2012, Fredrik has been a key contributor to Arthur D. Little’s Innovation Excellence frameworks and Dynamic Innovation Strategy solution, led global studies on breakthrough innovation, co-authored solutions on systematizing breakthrough innovation, and performed innovation assessments of a significant number of organizations globally. Fredrik holds an Industrial Engineering M.Sc. with dual specialization in Management and Economics of Innovation and Financial Mathematics. Prior to joining Arthur D. Little, Fredrik worked as a photojournalist for a variety of clients, such as GEO and National Geographic. Fredrik is fluent in both English and Swedish.